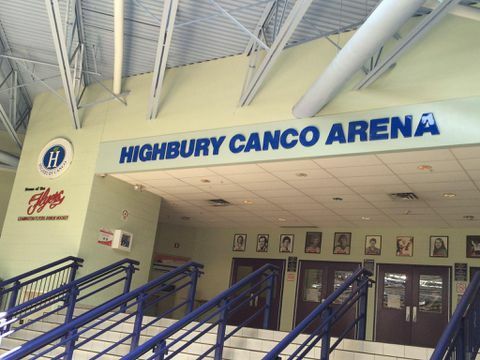 ‘For us, as a relatively new company, it was a way to make a strong gesture and demonstrate to the community that we plan to be here for the future,’ Sam Diab, Highbury president and CEO, says of deal to rename the arena in Leamington, Ont. It was about a year after Highbury Canco Corp. acquired the former H.J. Heinz tomato processing plant in Leamington, Ont., that the new owners asked about purchasing the naming rights to the town's main hockey rink. The 1,500-seat, Olympic-sized arena had been named for Heinz several years before to honour its donation toward the expansion of the Leamington Kinsmen Recreation Complex. But even after Heinz shut its 105-year-old tomato operation in 2014, its name still remained on the arena. Heinz had no objection when Highbury offered to take on the naming rights. "For us, as a relatively new company, it was a way to make a strong gesture and demonstrate to the community that we plan to be here for the future," says Sam Diab, Highbury president and chief executive officer. Unlike the original Heinz arrangement, which had no fixed term attached to it, Highbury signed a seven-year naming rights deal valued at a total of $140,000. The town has used some of the proceeds to upgrade the recreational facility's WiFi and sound systems, add LED exterior signage, and purchase new screens for the weight room. Municipalities have been naming arenas, pools, recreation complexes and other community assets after private donors as long as cheques have been written to help build them. While this type of courtesy naming practice is still common, many communities are taking a closer look at their naming-rights policies with a view to unlocking the revenue potential, says Bernie Colterman, managing partner of the Centre of Excellence for Public Sector Marketing (CEPSM) in Ottawa. In a 2015 survey of municipalities across Canada, CEPSM found that more than 80 per cent either have naming-rights agreements in place or want to develop policies that allow them to actively go after naming-rights sponsorships. Naming rights can be a tricky subject in communities that haven't updated their policies in a while. "I'm seeing lots of municipalities that are going through an awkward moment because they're realizing that names were put on their facilities in perpetuity. In many cases there isn't even any paperwork. If they want to be able to generate additional revenue from these facilities, they're kind of stuck," Mr. Colterman explains. "They're trying to be sensitive, but it's really a balancing act; municipalities don't want to be seen as selling out." Leamington is reviewing its naming-rights policies, a timely activity given the slew of recreational assets coming on stream, including new beach volleyball courts at Seacliff Park Beach, a field house at the Leamington Soccer Complex, and a new $1.2-million outdoor amphitheatre. The town is considering which of its assets it would and would not sell naming rights to, how long a naming agreement should last, and whether it will continue its practice of negotiating rights one-on-one with interested parties, or put a naming opportunity out to a competitive bid process. Even so, the town has no intention of soliciting naming-rights sponsorships, nor would it strip facilities that were named to recognize contributions by local community organizations such as the Kinsmen or Lions Club, says Peter Neufeld, Leamington's chief administrative officer. "This is a very generous community and we're not in the business of selling the naming rights to a building that was built on the backs of the service clubs." In contrast, Mr. Colterman says several municipalities he's talked to across the country have no qualms about going after new naming-rights opportunities. They're having their facilities assessed for fair market value, and, unlike the old in-perpetuity arrangements, are offering terms of between five and 20 years. "Many agreements now include an opt-out clause where either party has the right to terminate the agreement if it isn't working out financially or if it doesn't seem to be a good fit any more," Mr. Colterman says. "There is a realization that municipalities have to better protect themselves through these mechanisms." Mr. Colterman adds that while it's up to each community to decide where they draw the line on naming rights, most sponsors like to put their names on arenas and recreational centres because they tend to be among the largest and most frequently used buildings in smaller communities, offering multiple opportunities to engage with the public. They are also a way for local sponsors to build employee engagement programs by making fitness and event passes available to their staff. "Those types of buildings are also seen as being uncontentious within the community because there's already a certain level of commercialism in those facilities," Mr. Colterman explains. In Leamington, Mr. Neufeld makes the point that while the primary driver behind the town's naming-rights strategy will continue to be to recognize a donor's community commitment, "we want to make sure that we, as administration, can go to council with an idea that will maintain the integrity of community assets, but not ignore the opportunity to help fund the very projects that improve the quality of life for our residents and the experience for visitors." • Naming rights for multifacility complexes range between $30,000 and $160,000 per year. • Facilities that are visited by more than one million people annually fetch an average of $110,000 a year. • Arenas and pools within a larger recreation complex are often valued at about $25,000, while the naming of multipurpose rooms generate around $7,500 a year.